Although faced with a situation in which law enforcement officials were reluctant to use force against their own neighbors, Gov. Wendell Anderson declined to intervene. But when the fall of 1976 turned to winter, a new governor took office: a former Iron Range dentist named Rudy Perpich. Undated — Perpich was a fervent populist, the son of a Croatian immigrant miner. "Rudy had an enormous faith in his ability to deal with people directly," his policy aide, Ronnie Brooks, remembers. "He thought of himself as representative of the People, with a capital P, not of the bureaucracy or the bigwigs or the business people, and so he had I think a great hope and belief that he could get people together and solve the problems." Barely more than a week after he took office, Perpich disappeared from the Governor's Mansion, without telling Brooks or any of his staff. "We went off the to the National Governors' Association. He said he'd meet us there, and then instead... he went out to the country," said Brooks. Perpich drove an unmarked car to west central Minnesota and drove from farm to farm, stopping to ask directions of startled citizens. No one in state government knew where he was until he returned to the Capitol a day and a half later. Over the next year, he slipped away from the Governor's Mansion and visited farmers in central Minnesota several more times. 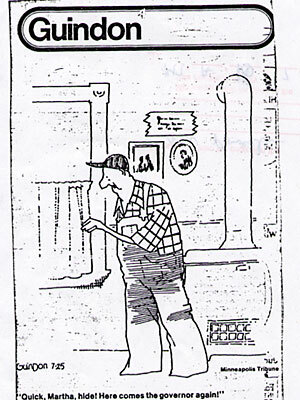 An editorial cartoon in the Minneapolis Tribune showed a farmer in overalls standing by a wood stove, peering through a window. The caption read, "Quick Martha, hide! Here comes the governor again!" Among the farmers who received surprise visits were Virgil and Jane Fuchs. "We were out doing chores, and there was strange car sitting by the house, and I walked in the house and here Gov. Perpich was sitting in the chair, at the location you're sitting now and our parish priest was sitting next to him," Virgil recalled recently. "Our parish priest had said he was coming out and he had someone with him, but he wouldn't tell me who he was. And I didn't know it was Gov. Perpich until they were standing at the door," Jane said. As the Fuchs remember it, Perpich sympathized with their plight. He told them "You guys really got stuck in this case," they say. But as Jane Fuchs put it in an interview a few months later, "We've got his sympathy, but we want justice now."